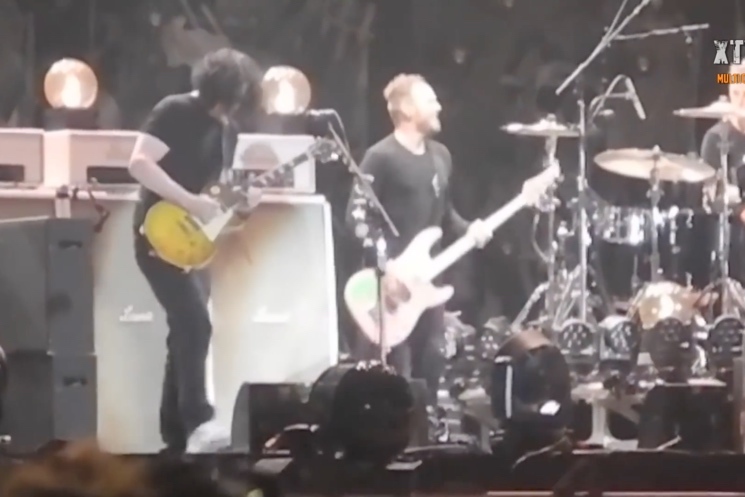 Watch Jack White and Pearl Jam Play "Rockin' in the Free World"
Pearl Jam have been covering Neil Young's "Rockin' in the Free World" for many years, and this weekend in Lisbon, they got a little help from Jack White, who sat in on guitar and backing vocals last night (June 14). Both White and Pearl Jam performed at Lisbon's NOS Alive Festival. This made it very convenient for the former White Stripes leader to join Pearl Jam during their encore-closing cover. White played a gold Gibson Les Paul and fired off a couple of solos during the seven-minute-long jam. He also shared a mic with Pearl Jam frontman Eddie Vedder during the group-sung chorus. Check out fan-shot footage of the epic tune below. This isn't the first time White and Pearl Jam have crossed paths. Pearl Jam recorded a live album at Third Man Records, at which time White guested during "Of the Earth."